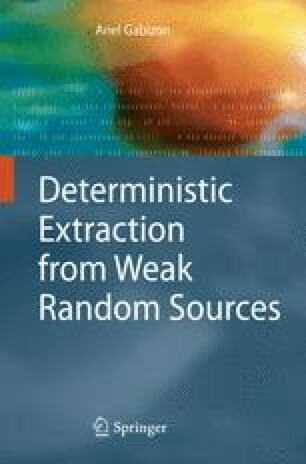 This monograph is concerned with the explicit construction of deterministic extractors and related objects. The current chapter gives an introduction to extractors and a sketch of the techniques and results of this work. We begin in Section 1.2 with what may be called the ‘classical motivation’ for extractors. Section 1.3 describes other motivations for deterministic extractors. In Section 1.4 we describe some of the main techniques used in this book. The subsequent chapters describe our results in detail. Each chapter is self-contained, perhaps with the exception of some basic background given in this introductory chapter. For a concise statement of all results, see the summary in the preface.